Early in the month of June 2012, Shakira Taylor, rising Junior at Virginia State University, participated in the UFSC MARK I Leadership Program in Charlotte, North Carolina. After the program was completed, she had the privilege of representing the Urban Financial Services Coalition on a White House Conference for Obama’s White House Initiative for Educational Excellence for African American Students. She actively listened and retained vital information from leaders in the White House. Heather Foster, Associate Director, Office of Public Engagement, served as the moderator for the call. The featured speakers for the call were Michael Strautmanis, Deputy Assistant to the President and Counselor for Strategic Engagement to the Senior Advisor Valerie Jarrett and Roberto Rodriguez Special Assistant to the President for Education Policy and Dr. Febrowski. Each speaker spoke on the different aspects of the Executive Order that established the White House Initiative on Educational Excellence for African Americans. 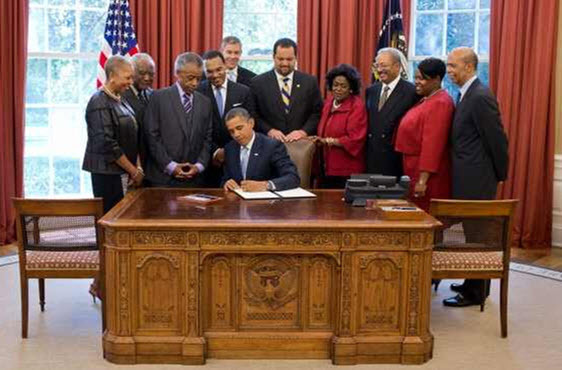 The Executive Order was signed on July 26, 2012 to improve outcomes and advance educational opportunities for African Americans. The White House Initiative on Educational Excellence for African Americans will work across Federal agencies and with partners and communities nationwide to produce a more effective continuum of education programs for African American students. The Initiative aims to ensure that all African American students receive an education that fully prepares them for high school graduation, college completion and productive careers. In the nearly 60 years since the Brown v. Board of Education decision put America on a path toward equal educational opportunity, Americaâs educational system has undergone a remarkable transformation. Many African American children who attended substandard, segregated schools in the 1950s have grown up to see their children attend integrated and effective elementary and secondary schools, colleges and universities. Nonetheless, substantial obstacles to equal educational opportunity still remain in America’s educational system. African American students lack equal access to highly effective teachers and principals, safe schools and challenging college-preparatory classes and they disproportionately experience school discipline and referrals to special education. Significantly improving the educational outcomes of African Americans will provide substantial benefits for our country by advancing important outcomes, like increasing college completion rates, employment rates and the number of African American teachers. Enhanced educational outcomes for African Americans will lead to more productive careers, improved economic mobility and security and greater social well-being for all Americans. The Urban Financial Services Coalitionis a non-profit organization that provides professional development programs, supports educational advancement and promotes economic empowerment for its members and minority communities. Members receive benefits such as international networking and a nationwide job bank while younger individuals may be eligible for scholarships in the finance areas and keys to ensure success in their business profession including entrepreneurship, leadership, as well as teamwork. Also, they promote better access to financial services for low-to-moderate income populations and communities, to expand the knowledge of financial literacy. Virginia State University (VSU) was founded on March 6, 1882. Virginia State is one of the 105 Historical Black Colleges and Universities spread throughout the United States. Over time VSU developed as the United States first fully state-supported four-year institution of higher learning for African American students. The University’s mission sets out to empower all individuals regardless of ages and career paths they may follow. Late 2009, it was announced by the Virginia State University Board of Visitors that VSU would be further guided and directed under Dr. Keith T. Miller. The students at Virginia State University continue to “Dream, Explore, Succeed” and ShakiraÂ exhibits these critical qualities of VSU through the Urban Financial Services Coalition.